Santana Dharma, recognized as a universal dharma, teaches the path of self-realisation through values and to use it as a tool for right political governance. 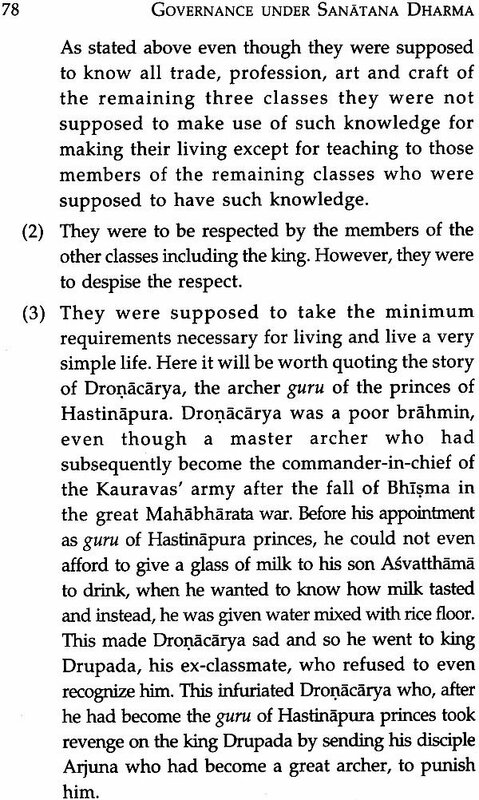 The book explains how the west has misinterpreted the Sanatana Dharma and the same time gives us an eye to watch this Dharma in the modern context. It broadly defines the difference between happiness and pleasure; spiritualism and materialism. It teaches us the value of moral conduct and materialism. It teaches us the value of moral conduct and morality as a way to end corruption. 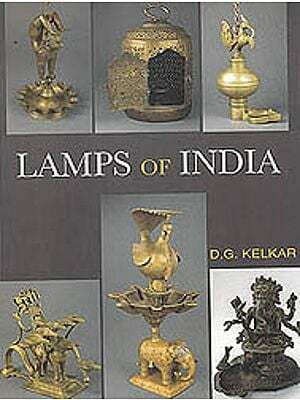 The work is a judicious mix of ideas from Hindu religious literature and views of scholars. The book will be useful to a range of readers: those involved in governance, administrators, teachers and scholars of religious, especially Hinduism. V.S. Sardesai was born at Panaji (Goa) in 1935 and later shifted to Mumbai for higher studies. He worked in the legal departments of various institutions and retired as Asst. General manager from departments of various institutions and retired as Asst. General Manager form the Bank of India in 1993. Thereafter, he worked as legal consultant in Indian Institute of Bankers and the Bank of Tokyo-Mitsubishi Ltd. till he shifted to Bangalore in 2004. His articles on legal matters and historical subjects were published in several magazines & newspapers. Other books of his credit are: Amartya Sen’s Hindu Bash, Can a Secular be a Fundamentalist and Somantath by Romila Thapar: A Critical Study. 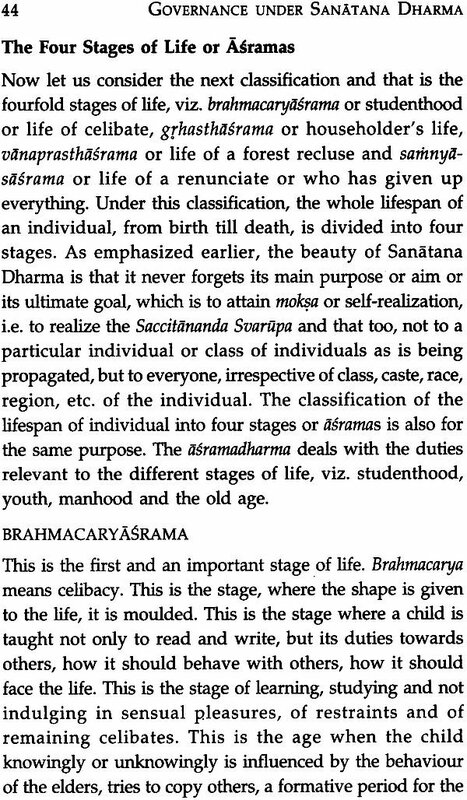 Since I became aware of Santana Dharma as my religion, I was made aware that one of its features, viz. the caste system, is a black dot on its otherwise broad principles. Not only that, but many Hindus are apologetic because of it and some are even ashamed to call themselves Hindus. 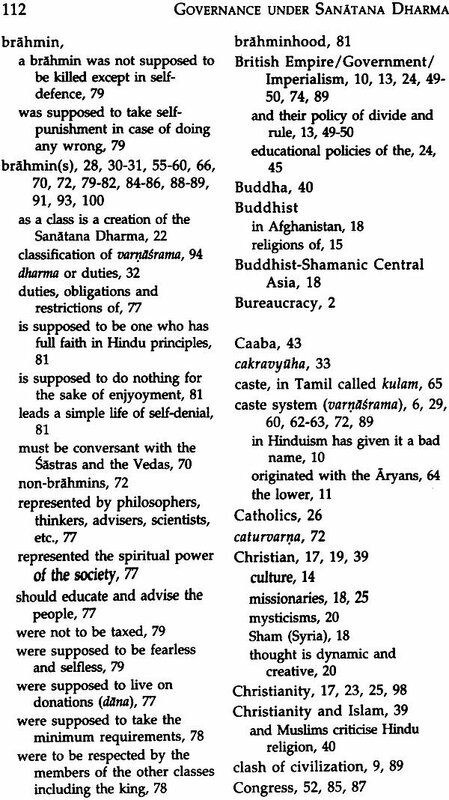 I was always wondering how a religions which can claim to be a world religion, a religion which is based on Advaita – Monism – which preaches that everything is Saccidananda Svarupa can have caste as one of its major features, which not only differentiates between human beings but treats some human begins as of low class and inhumanly. While doing my post graduation I came across two books, one Eastern Religious and Western Thought by Dr S. Randhakrishnan and another Caste System form Hindu Custom and their Origin by Stanley Rice, which cleared some of my doubts. As the books were of print and easily available, I took out notes of both of them for my future references. But afterwards due to my other preoccupations I forgot about them. After my retirement, while going through my old papers I came across these notes, which reminded me of my curiosities, and I thought that time had now come to pursue the matters and I started looking for literature and books on the subject. I read Hindu Dharma and Aspects of Religion by pujyasri Chandrasekharendra Saraswati Swami, Who is a Hindu? by Koenraad Elst, Deeper Aspects of Hinduism by Mumtaz Ali, Stray Thoughts on Dharma by Jnanananda Bharati and many other books by different authors on the subject. But my doubts Still persisted. While going through allied subjects, I came across a book by David Frawley The Myth of Aryan Invasion theory of Max Muller. And then it dawned on me that the premises on which our whole edifice is built may not be correct. 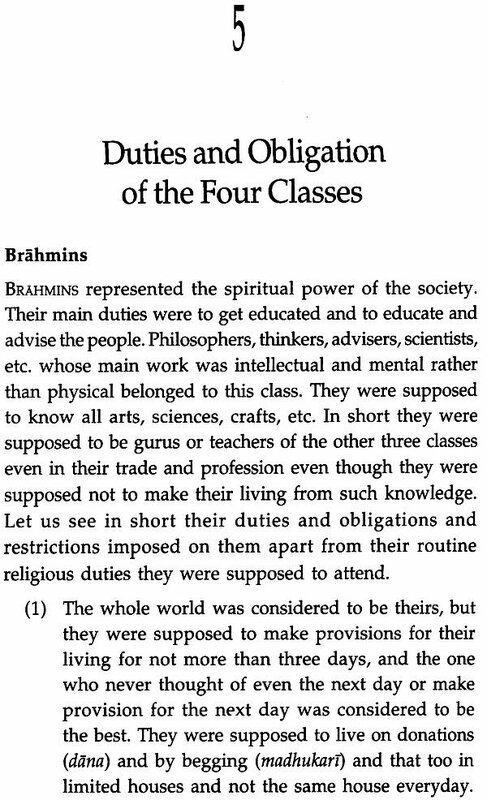 Is the caste system a creation of Hinduism as is being told? Or are all these misconceptions created by interested parties to denigrate Hinduism? I remembered the two main teaching of Hinduism which are supposed to be its basic principles, viz. that we should not accept anything event if told or taught by Brahma Himself unless we are satisfied about its truthfulness an experience it, and secondly faith starts where logic ends and that faith is not against logic or reason but beyond it. I began to look into the matters afresh without any preconceptions. And I got the answers. 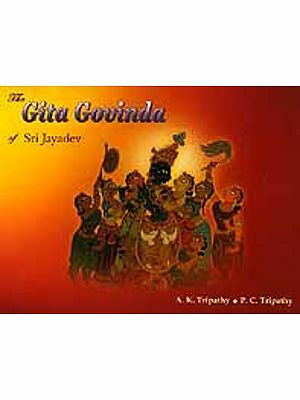 This book is written by a layman for a common man to explain what is Sanatana Dharma or Hinduism as understood by him and to remove the misconceptions. And I will be satisfied and my purpose will be served if Hindus, instead of becoming apologetic, start taking pride in calling themselves Hindus. I takes the opportunity to thank the publishers of this book, Readworthy Publications and Shri Surya P. Mittal for agreeing to publish this book as everyone knows that it is difficult to get a publisher to publish a book by an unknown author especially on a subjects like Hinduism. Today’s intellectuals in India are very much perturbed and worried about the future of India. They have got the slightest doubt about the abundance of resources, means, intellects, potentials and whatever else is required for the development of India for making it a developed country in a very near future instead of continuing to remain a developing country. Still in spite of all this, they sincerely doubt that if things go on like at present instead of becoming a developed country. This anguish of theirs is reflected I the three recently published books, Governance by Jagmohan and The Future of India by Bimal Jalan. There may be other on the way of publishing their books. But the question is, why all of a sudden they are showing their anguish now? Did not Mrs Indira Gandhi say that corruption was a universal phenomenon, long back? Why the only now they are expressing their anguish and worries ? Has the corruption gone out of proportion? Has our bureaucracy become so selfish , shameless and senseless that they neither feel anything for Indians and their sufferings nor do they care for India’s interest? But why to blame the bureaucracy alone? What about our politicians? In facts, it is the failure of our political leadership to give proper directions especially in the initial stage of our independence that has brought about the present sorry state of affairs. Had our political leadership been enlightened enough and looked to the interest of Indians and the nation, instead of their own personal interest, the bureaucracy would not have reached this stage and would have fallen in line. In this connection the blame lies firstly with our leadership at the time of Independence led by our first Prime Minister Pandit Jawaharlal Nehru. Mr Jagmohan has correctly described was so possessed with half- backed ides that it contented itself by giving to the nation an outward frame of democracy without taking any worthwhile measures to ensure that this frame rested on the foundation of a re-awakened nobility and not on the piles of social and cultural garbage that she had gathered during the long period of decay and degeneration. Outsiders may praise our democracy as the greatest democracy of the East. But the fact remains that our democracy is not the real democracy but its caricature. And what is the reason for all this? Again to put it in Jagmohan’s words, the reason is the failure of our leadership during the post independence period to consider and find out the reasons why the people and its leaders in the past placed creed, caste and personal end above country. Had they done so they would have found the answer that it lay in the degraded soul of India’s degenerated past and that the primary task of the nation was to relieve this soul of its degradation and restore it to its original purity. On the other hand, it failed to create a moral earnestness in the nation and establish an ethical state. It has failed to understand the futility of its attempt to create a healthy system of governance out of an unhealthy mind, a secular sate out of non-secular ethos, and a meaningful framework out the a democracy with my an exploitable citizenry at its base. It was a great misfortune of India to have such a personality as our first prime minister. No doubt Pandit Nehru was a towering personality, tallest amongst the leaders of the time, most popular and loved by Indians. There is also not the slightest doubt about his sincerity, his interest in India's development. 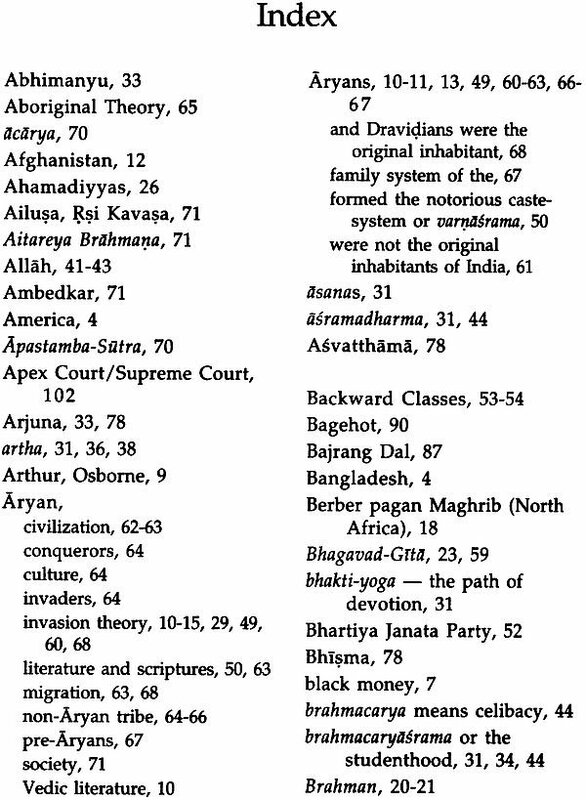 But because of his prejudiced, biased views about Hinduism, he failed to awaken the Indian soul from its degradation. In fact, he never understood Indian soul. On the other hand, in the words of Mr Jagmohan, "It turned its gaze to the comparatively simpler task of building a constitutional machine and setting up modern institutions, forgetting that a healthy soul-force was required to propel that machine in the right direction and operate these institutions with clean hands." Generally, where there are different religious communities in a society, which has adopted a democratic form of government, there can be three types of government. One is theocratic, where the majority religion becomes dominant and the state is governed on the basis of majority religion. Such form is adopted in Pakistan and Bangladesh. The second form is secular, where the state does not allow any religion to interfere in the affairs of the state, irrespective of whether there is one religion or more and it remains impartial to different religions. Such a form of democracy is adopted by most of the states of Europe and America. The third form is what can be called a minority form of democracy and India has adopted this form of democracy or rather India is the originator of this form of democracy. Under this form of democracy, the laws applicable to the citizens of the state are divided in three categories, civil, criminal and personal, and not two as in the case of secular, without clearly earmarking their domain. Further civil and criminal laws are in the domain of the state, and personal laws are supposed to be in the domain of the religion. However while the state freely interferes not only with the personal laws of the religious majority community but also with their religion and religious institutions. It scrupulously avoids interfering not only with the personal laws of the religious minority communities but also with their religion and, of course, with their religious institutions. And even though at present state judiciary is supposed to adjudicate on personal laws, the trend appears to be that slowly separate religious courts for the minorities will administer the personal laws of the religious minorities. Further, already minority communities have been bestowed with special rights. In short, even though religious minorities are minorities because of their numbers, for all practical purposes they enjoy special rights, privileges and protections that are denied to the majority community. And the unfortunate part is that, all this is done in the name of secularism, and it could be achieved because of the indifference of the majority community which appears to have been paralysed, and if anybody or any institution agitates against such attitude, it is branded as communal and fundamentalist. All this has resulted in national disintegration, instead of national integration as envisaged under our Constitution. Even though caste system has been officially abolished, our nation is divided not only in castes but also in sub-castes, classes, tribes and what not. The morality and ethos is at the minimum level, and still some of our political parties agitate to abolish these subjects from the school curriculum. Corruption is at the highest level not only amongst the bureaucracy but more at the political level. Earlier at the time of Independence, there were some leaders above board. But now their number is decreasing. The things are moving to the worst. The question is why only now the things are moving to the worst? What is the reason? What was the position earlier? Whether our ancestors had considered this aspect of human nature and had taken remedial steps or formulated a mechanism whereby such incidents were kept to the minimum? How Hinduism dealt with such problems? 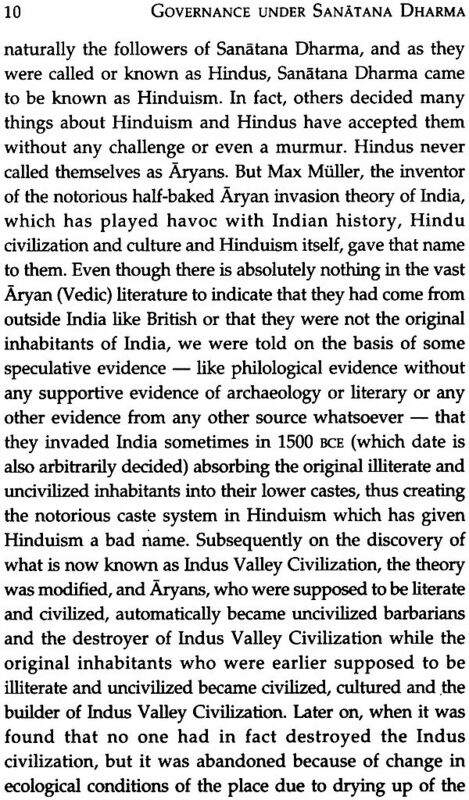 And if Hinduism has dealt with such problems earlier, whether the same mechanism can be useful in the present era? To consider these questions, we have to know our aim of life. Was, in earlier time, the aim of life different than in the present era? If we study our religion, we find that in earlier times also the aim was the same that everyone should be happy in this life. The aim or goal of our Sanatana Dharma or Hinduism was also to realize our Saccitananda Suarupa that is to be permanently happy. If the goal of life is the same, the question is why only now we find that the people are more corrupt than the earlier times. The answer lies not in the goals, but to the meaning given to happiness and in the means or ways of attaining it. Earlier because of our religious, moral and ethical education and the atmosphere and the environment in which the people were brought up, the people knew and were convinced that happiness couldn't be bought by money power. One can purchase anything by money except happiness. And as such they were not giving it so much or undue importance and were not after money. They were not equating happiness with pleasure. Now the conditions are different. May be due to the influence of the West and their material civilization, people now feel that happiness can be bought by money power. 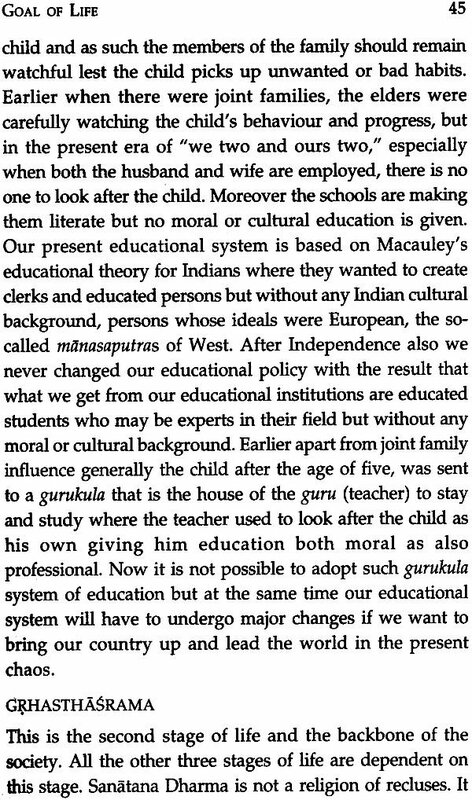 I sincerely feel that even if moral and ethical education is given to our IAS or other candidates for some years as suggested by Mr Jagmohan, the things will not improve unless the people are convinced that even though they may get everything by money power, the happiness will elude them. Secondly, the social conditions should be such that the people should not be able to make use of such black money. At present, we hardly find any corruption case which has resulted in conviction. The question, therefore, is how our Sanatana Dharma, in earlier times, could convince the people that even though money was required for maintenance of family, it was not everything in life and it could not be the only purpose of life. 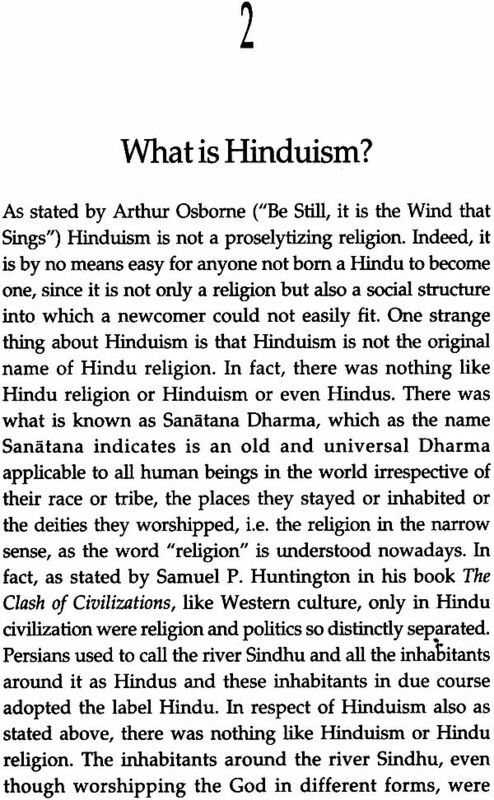 For finding out the answer, we should know what is Sanatana Dharma or Hinduism?